"...art can make rage look beautiful and noble." 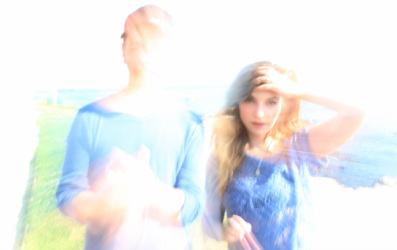 Athens, Greece duo Keep Shelly in Athens seem as even-keeled as the music they make. Although their music is frequently described as "ethereal, dream pop, and haunting", singer Sarah P and her partner RΠЯ have created a series of singles and EPs filled with music that is actually indescribable. Their music was spread via magazines like MOJO, blogs like Gorilla vs Bear, a live recording by Daytrotter Studios, and good old word of mouth. In fact, in April of this year The Hype Machine named the band one of the "top ten most blogged acts", in company with Radiohead and Toro y Moi. Keep Shelly in Athens (a play on the pronunciation of Athens suburb Kypseli) played colleges, bars, and festivals across the U.S. and Europe as they quickly built a strong fan-base for their unique music, the playing and production talents of RΠЯ, and the vocal stylings and appeal of Sarah P.
I caught up with them via e-mail to peel away a few layers of their music on the eve of their debut full-length album At Home being released on Cascine on September 17, 2013. I asked Sarah and RΠЯ what it was like to play at Coachella in April of 2012 with only a handful of singles and EPs out on independent labels such as Forest Family and Planet Mu. Is touring something you enjoy or it is part of staying viable as a band as you build a fan base? Touring is the fun part of the adventure. We write our songs, we rehearse with our band and then we get out of town to communicate our music! There is nothing better in the world of the artist than traveling around and performing! Are smaller venues like clubs easier or more difficult to play than larger spaces? How is the vibe different? It depends! We can say that we have played by day, night, we did small venues, big stages... It is always different. Most of the times, in smaller venues, it gets more intimate, which is nice for our music. But some other times, an open-air stage can also fit well. Maybe when we have started, we would def vote for smaller venues. Now we just don't care, each experience is different, every show is a special one and the vibes from the people are the most refreshing thing in the world! KSIA has been on a number of smaller labels since In Love With Dusk came out. It is true, and that was part of the plan. We didnt have a full length by that time. We just had EPs; those independent-lovely-labels gave us the chance to release our tracks. Without them no one would ever hear our music. We just entered Cascine family. We have got our LP baby, (and) we wanted the best for it. The format and images on all of your record covers seem to be similar (beautiful and calm).How much input do you have on photos, layouts, etc? Our artwork is really important to us. Our friend and photographer, Tolis Elefantis, does our artwork for our records (and lately took our new band press photos). It has to be calm, it has to be beautiful to look at. There is a balance between the sometimes dark and melancholic sound of ours and the peaceful landscape. When I was in Athens five years ago it seemed to be a vibrant place musically. It seemed a lot of it was driven by the political situations and frustrations experienced by the entire country. When people have been left with nothing but hope, it is easier to turn to art. It is true that Athens lately has been even more arty and vibrant. Many things are happening around, many new talents come out and are determined to stand tall and show everyone that they can do something nice and special. There is rage definitely, but art can make rage look beautiful and noble. 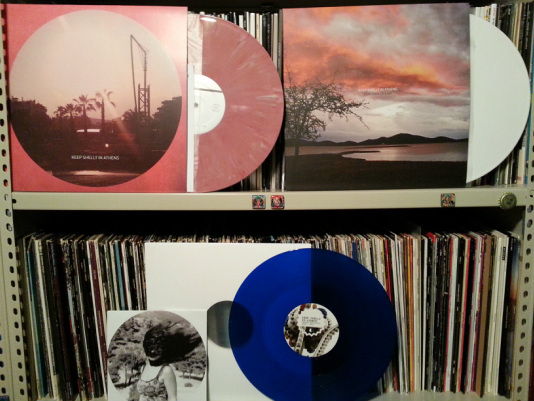 Many of we vinyl collectors greatly appreciate you releasing your music on record- especially colored vinyl. Do you two prefer vinyl over CD or MP3, or is it just one of the mediums you work with? We love our vinyl. We are always so happy when we get those in our hands, so proud about how sweet they look! It is definitely more personal like that. It sounds better, too. We hope we will always get the chance to release in vinyl! We've had a nice introduction to your upcoming full-length album At Home with "Recollection" and moe recently "Oostende". Are there any big changes in store for fans or does it continue in the same vein? Maybe "Recollection" is the most pop song of the album. We have tried to experiment with our sound, and the result was many different songs that somehow link together. We get dark, then we light up again. We have fun, we cry. This album's theme is love and especially lost love. Love someone else, love yourself, love something...what happens when that love is gone. There are many different shades around this theme, don't you think? I know that you will be doing a US tour in the fall. How extensive will it be? Is it part of a world tour? Oooh (a) world tour would be nice. But, no, it will be US for the moment! It will be almost for a month. As we come from afar, we need to do as many dates as we can when we visit! We are pretty psyched about it..we cannot wait to share our new stuff. We also have a new guitarist, and we have also changed many things and we cannot wait to try those on stage!! Keep Shelly in Athens kick off their US tour in support of At Home on October 9th in Washington, DC, wind their away around the States, and even venture up into Canada before headlining Glasslands in Brooklyn at the end of that month.